In cakephp,various validations rules are used to validate your forms like required, min length, maxlength etc.Such validation rules makes form handling much easier. But the thing we are going to discuss here is the difference between required and nonEmpty() rules. The use of both is quite easy to understand, but the interesting thing is difference between them. If you don't know how to use them or define in the model file, then below are examples of each. Above code will just check that the “title” field must not be left blank, BUT only if its present..!! Now if you remove the “title” field from the form and submit the form then it will successfully submited..!! What happened with the model rule nonEmpty ?? Reason is nonEmpty simply check the Present Data validation, on the other end by using required=>true you are telling cakephp that on submission of the form this field must be there in the data array. If you remove the field having the required=>true validation and submit the form then it will throw the validation error. 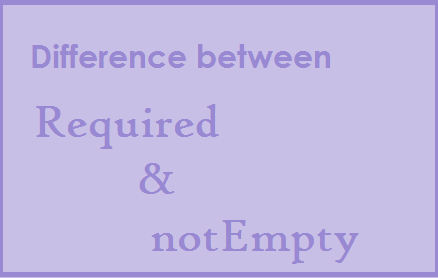 We have discussed about the difference between the required and nonEmpty, but there is one similar term called 'allowEmpty'.The difference between required and allowEmpty can be confusing. - "nonempty" is defined as !empty($value) ||is_numeric($value). The numeric check is so that CakePHP does the right thing when $value is zero. If you write above code then it will allow empty field,but if you have input the data that doesn't match with other rule(s) (here alphaNumeric) then it will throw error. Note : 'required' and 'allowEmpty'can not be used without defining rule.It will throw an error for the validation handler. You can not write like this.